Alcohol abuse.. or just an eye to the future.? Horizon Fuel Cell Technologies have just announced a new educational kit, a table sized kit which can be powered on a shot of your favorite alcohol - or a cheap vintage for that matter. The point being that the kit permits teachers and students to directly interact with a fuel cell and see how it will power the fan for days on end. 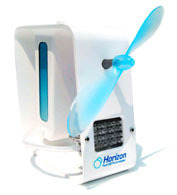 While I do not think this fan will change the world much, it is intereting that Horizon have found a niche making energy technology toys and educational tools. This can only be good for the world. Even at 99 bucks this is a cool little product. Still making a fuelcell like this have serious implications - I can easily see this deployed in less fortunate parts of the world, as a fan, charging a laptop, or powering a water cleaning station. After all, Rice Vine seems to be a readily available and abundant resource. Click to visit Horizon's website and get your kit now. Thai-LA.com have been based on xaraonline.com for years - however the updating and maintainance have become somewhat tidious so this month I have started setting the site and the old stories up in a modern blog engine.. so have patience while I figure this . While I am at my core a Mac Lover, this is something I have been ignoring for years, and my office is full of PC computers, mostly laptops. Until this year we have been purchasing WinXP professional systems along with a few Tablet computers. However this year we started getting a couple of VISTA laptops, and as much as I love the Fujitsu Tablet computers, this have been a disastrous experience, this new "improved" software have shown us the "blue screen of death" more often than any other computer we have ever owned. We can simply not effort to have the girls in customer service crash while on the phone with customers several times each day. As a result we are now getting ready to invest in multiple iMac computers. We are just a little company, but if we are feeling desperate enough to consider purchasing several new seats of Photoshop and other expensive softwares, to go with a new style of OS in the office, just to escape MS VISTA, then Im positive we are not alone, this must be a very serious problem for Microsoft. Stay tuned as we struggle forward away from vista. When I last was in Thailand I did something new for me, I made a point of ONLY photographing spherical panoramas, while this seems straight forward it was actually quite a undertaking. 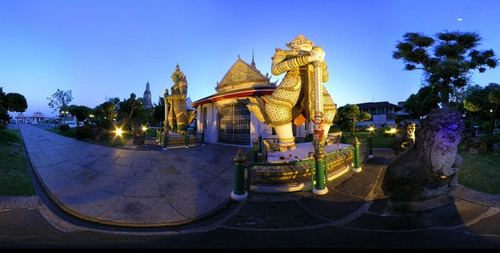 The result have been over 50 high-resolution panoramas of Bangkok and Thailand in general. These were photographed with a Nikon 5400 equipped with a Spherical lens which captures about 186 degrees field of vision. To travel lighter I designed and manufactured a wood bracket using CAD and the LASER in my office, the result is a very light weight bracket for traveling, however because of the accurate nature of the laser cutting, this bracket have quickly become a bit of a popular item amount experienced panorama photographers.